Vladan’s father Nedelko, of Serbian background, is a proud member of the Yugoslav People’s Army. His mother is a strong willed Slovenian woman, who, against her parents’ wishes, left her homeland and married her young soldier. The stirrings of political insurgency put an immediate end to their happy domestic life in Pula as Nedelko is seconded and the family is moved to a hotel in Belgrade. When it becomes clear that this little trouble is not about to just blow over, Vladan’s father disappears from his life. He and his mother will eventually end up in Slovenia, and within a few years news will come that his father, now a General, has died. Or so he is led to believe. Seventeen years on, Vladan is still living in Ljubljana, Slovenia, but restless and unable to find his footing. He tosses his father’s name into Google. What he discovers turns his fragile world upside down. General Borojević is not dead, but rather he is a fugitive, wanted for war crimes. Rattled by this news Vladan sets out to find his father tracing a trail that links figures from his father’s past, a relative, an assumed identity, and clues to where he lived or may yet be. When his search leads him back close to home, the bits and pieces he gathers raise even more questions, and force him to look deeply inside himself to determine if he even wants the answers he had craved. Whether he is looking back to his troubled childhood and adolescent years and his increased alienation from his mother, or looking forward to what truths may or may not lie ahead; his emotions are painfully open and honest. Even if he sometimes leans toward the melodramatic, it is hard to resist being pulled into his account of a life torn apart twice over and the pain of the very difficult dilemma he will ultimately face. Yugoslavia, My Fatherland tells a multi-layered tale. The tragic dissolution of the Borojević family is traced out against the trauma and conflict that would rend the states of the Balkan region apart and still threatens further division in certain areas. He encounters many who bear wounds too deep to heal. But it is much more than that. Questions of personal and national identity are central. 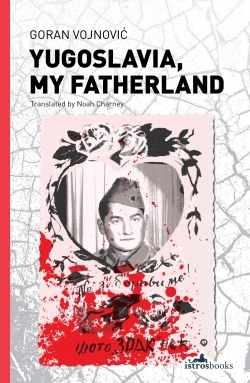 Vladan is not only seeking an understanding of himself and his relationship to his ethnic heritage, but he is striving to reconcile his memory of a loving father with a fugitive war criminal. A very human longing for closure and healing drives him to seek out and confront the man who used to be his father, whoever he is. However, somewhere along the way he will have to stop to measure the costs and decide what he is willing to risk. Translated from the Slovene by Noah Charney, Yugoslavia, My Fatherland is original, ambitious in scope, and another welcome addition to the catalogue of independent UK publisher Istros Books. This is such an amazing post! I really love your blog so much and in turn cannot stop reading all of your posts. I look forward to reading more from you! Like the woman says. 🙂 If I was in the UK I’d be there! Having just read Dasa Drnic’s Leica Format, which deals (among other things) with recent Balkan history I’m still amazed at the conflict which took place in the heart of Europe not so long ago. I hope I can find the time to explore some more of the literature, like this. This book has a somewhat more broad perspective than other Istros Books I’ve read. I googled maps and basic history a little at the beginning because it is one thing to know there was this serious conflict, another to keep details straight. In the end this book becomes a much more personal journey. I definitely want to read more from this region, I have always thought that the underlying conflicts that have long divided the Balkans adds a necessary tension to the literature appealing to me in the same way South African lit does.